Workplace Harassment, 8th Edition, provides learners with a comprehensive look at key aspects of harassment, including definitions and best practices for handling and reporting harassment. 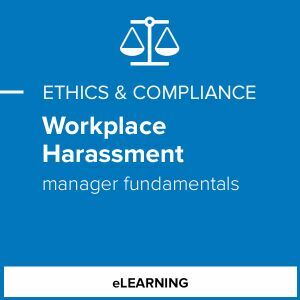 Learners will explore harassment fundamentals, best practices for responding to harassment and additional content that will help them comply with policy and expectations. Manager-specific versions include additional information that covers their unique responsibilities in preventing and responding to harassment, including handling complaints and creating a culture of ethics and respect. 60-minute Manager Fundamentals adapts core lessons to the specific roles and responsibilities of managers, and addresses how to manage and respond to harassment complaints, as well as leading and maintaining a culture of respect and prevention. Workplace Harassment, 8th Edition, provides learners with a comprehensive look at key aspects of harassment, including definitions and best practices for handling and reporting harassment. 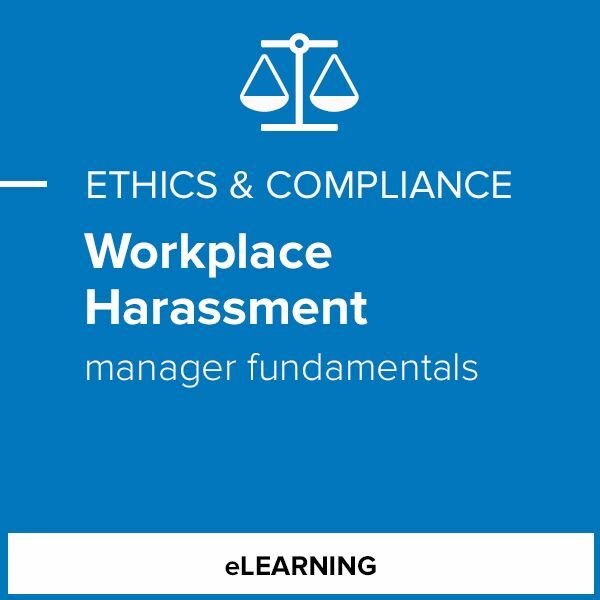 Learners will explore harassment fundamentals, best practices for responding to harassment and additional content that will help them comply with policy and expectations. 35-minute Employee Plus for Select States extends those core learnings to include workplace relationships and additional information that aligns to training specifications for employees in New York, Maine and Delaware and includes state-specific information.